"The First Crusade" redirects here. For other uses, see The First Crusade (disambiguation). The First Crusade (1095–1099) was the first of a number of crusades that attempted to recapture the Holy Land, called for by Pope Urban II at the Council of Clermont in 1095. Urban called for a military expedition to aid the Byzantine Empire, which had recently lost most of Anatolia to the Seljuq Turks. The resulting military expedition of primarily Frankish nobles, known as the Princes' Crusade, not only re-captured Anatolia but went on to conquer the Holy Land (the Levant), which had fallen to Islamic expansion as early as the 7th century, and culminated in July 1099 in the re-conquest of Jerusalem and the establishment of the Kingdom of Jerusalem. The expedition was a reaction to the appeal for military aid by Byzantine Emperor Alexios I Komnenos. Urban's convocation of the Council of Clermont was specifically dedicated to this purpose, proposing siege warfare against the recently occupied cities of Nicaea and Antioch, even though Urban's speech at Clermont in the testimony of witnesses writing after 1100 was phrased to allude to the re-conquest of Jerusalem and the Holy Land as additional goals. The successful Princes' Crusade was preceded by the "people crusade", which was a popular movement instigated by Peter the Hermit in the spring of 1096. Mobs of peasants and laymen travelled to Anatolia where they came up against the Turks, on the way attacking populations of Jews in the Rhineland. They were decisively defeated at the Battle of Civetot in October. 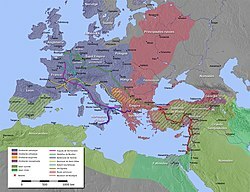 The Princes' Crusade, by contrast, was a well-organized military campaign, starting out in late summer of 1096 and arriving at Constantinople between November 1096 and April 1097. The crusaders marched into Anatolia, capturing Nicaea in June 1097 and Antioch in June 1098. They arrived at Jerusalem in June 1099 and took the city by assault on 7 July 1099, massacring the defenders. A brief attempt by the Saracens to recapture Jerusalem was repulsed at the Battle of Ascalon. During their conquests, the crusaders established the Latin Rite crusader states of the Kingdom of Jerusalem, the County of Tripoli, the Principality of Antioch, and the County of Edessa. This was contrary to the wishes of the Eastern Rite Byzantines, who wanted the land that the Muslims took from them returned, rather than occupied by Latin Catholics. After the retaking of Jerusalem, most of the crusaders returned home. This left the crusader kingdoms vulnerable to Muslim reconquest during the Second and Third Crusades. The causes of the Crusades in general, and particularly of the First Crusade, is widely debated among historians. While the relative weight or importance of the various factors may be the subject of ongoing disputes, it is clear that the First Crusade came about from a combination of factors in both Europe and the Near East. Its origin is linked both with the political situation in Catholic Christendom, including the political and social situation in 11th-century Europe, the rise of a reform movement within the papacy, as well as the military's and religious confrontation of Christianity and Islam in the East. Christianity had been adopted throughout the Roman Empire in Late Antiquity, but in the 7th to 8th centuries, the Umayyad Caliphate had conquered Syria, Egypt, and North Africa from the predominantly Christian Byzantine Empire, and Hispania from the Visigothic Kingdom. In North Africa, the Umayyad empire eventually collapsed and a number of smaller Muslim kingdoms emerged, such as the Aghlabids, who attacked Italy in the 9th century. Pisa, Genoa, and the Principality of Catalonia began to battle various Muslim kingdoms for control of the Mediterranean Basin, exemplified by the Mahdia campaign of 1087 and battles at Majorca and Sardinia. Between the years of 1096 and 1101, the Byzantine Greeks experienced the crusade as it arrived in Constantinople in three separate waves. In the early summer of 1096, the first large unruly group arrived on the outskirts of Constantinople. This wave was reported to be undisciplined and ill-equipped as an army. This first group is often called the Peasants' Crusade or the People's Crusade. It was led by Peter the Hermit and Walter Sans Avoir. The second wave was also not under the command of the Emperor and was made up of a number of armies with their own commanders. Together, this group and the first wave numbered an estimated 60,000. The second wave was led by Hugh I, Count of Vermandois, the brother of King Philip I of France. Also among the second wave were Raymond IV, Count of Toulouse and the army of Provençals. "It was this second wave of crusaders which later passed through Asia Minor, captured Antioch in 1098 and finally took Jerusalem 15 July 1099." The third wave, composed of contingents from Lombardy, France, and Bavaria, arrived in Jerusalem in the early summer of 1101. At the western edge of Europe and of Islamic expansion, the Reconquista in the Iberian Peninsula was well underway by the 11th century. It was intermittently ideological, as evidenced by the Codex Vigilanus compiled in 881. [note 1] Increasingly in the 11th century foreign knights, mostly from France, visited Iberia to assist the Christians in their efforts. [note 2] Shortly before the First Crusade, Pope Urban II had encouraged the Iberian Christians to reconquer Tarragona, using much of the same symbolism and rhetoric that was later used to preach the crusade to the people of Europe. The heart of Western Europe had been stabilized after the Christianization of the Saxon, Viking, and Hungarian peoples by the end of the 10th century. However, the breakdown of the Carolingian Empire gave rise to an entire class of warriors who now had little to do but fight among themselves. The random violence of the knightly class was regularly condemned by the church, and in response, it established the Peace and Truce of God to prohibit fighting on certain days of the year. At the same time, the reform-minded papacy came into conflict with the Holy Roman Emperors, resulting in the Investiture Controversy. Popes such as Gregory VII justified the subsequent warfare against the Emperor's partisans in theological terms. It became acceptable for the Pope to utilize knights in the name of Christendom, not only against political enemies of the Papacy, but also against Al-Andalus, or, theoretically, against the Seljuq dynasty in the east. To the east of Europe lay the Byzantine Empire, composed of Christians who had long followed a separate Orthodox rite; the Eastern Orthodox and Roman Catholic churches had been in schism since 1054. Historians have argued that the desire to impose Roman church authority in the east may have been one of the goals of the crusade, although Urban II, who launched the First Crusade, never refers to such a goal in his letters on crusading. The Seljuq Turks had taken over almost all of Anatolia after the Byzantine defeat at the Battle of Manzikert in 1071; however, their conquests were piecemeal and led by semi-independent warlords, rather than by the sultan. A dramatic collapse of the empire's position on the eve of the Council of Clermont brought Byzantium to the brink of disaster. By the mid-1090s, the Byzantine Empire was largely confined to Balkan Europe and the northwestern fringe of Anatolia, and faced Norman enemies in the west as well as Turks in the east. In response to the defeat at Manzikert and subsequent Byzantine losses in Anatolia in 1074, Pope Gregory VII had called for the miles Christi ("soldiers of Christ") to go to Byzantium's aid. This call was largely ignored and even opposed. The reason for this was that while the defeat at Manzikert was shocking, it had limited significance and did not lead to major difficulties for the Byzantine empire, at least in the short term. The Byzantine empire had lost control over most of Anatolia in the decade following the disastrous Battle of Manzikert. Until the Crusaders' arrival, the Byzantines had continually fought the Seljuqs and other Turkish dynasties for control of Anatolia and Syria. The Seljuqs, who were orthodox Sunni Muslims, had formerly ruled the Great Seljuq Empire, but by the time of the First Crusade it had divided into several smaller states after the death of Malik-Shah I in 1092. Malik-Shah was succeeded in the Anatolian Sultanate of Rum by Kilij Arslan I, and in Syria by his brother Tutush I, who died in 1095. Tutush's sons Fakhr al-Mulk Radwan and Duqaq inherited Aleppo and Damascus respectively, further dividing Syria amongst emirs antagonistic towards each other, as well as Kerbogha, the atabeg of Mosul. Egypt and much of Palestine were controlled by the Arab Shi'ite Fatimid Caliphate, which was significantly smaller since the arrival of the Seljuqs. Warfare between the Fatimids and Seljuqs caused great disruption for the local Christians and for western pilgrims. The Fatimids, under the nominal rule of caliph al-Musta'li but actually controlled by vizier al-Afdal Shahanshah, had lost Jerusalem to the Seljuqs in 1073 (although some older accounts say 1076); they recaptured it in 1098 from the Artuqids, a smaller Turkish tribe associated with the Seljuqs, just before the arrival of the crusaders. Byzantine emperor Alexios I Komnenos, worried about the advances of the Seljuqs in the aftermath of the Battle of Manzikert, who had reached as far west as Nicaea, sent envoys to the Council of Piacenza in March 1095 to ask Pope Urban II for aid against the Turk. Urban responded favourably, perhaps hoping to heal the Great Schism of forty years earlier, and to reunite the Church under papal primacy by helping the Eastern churches in their time of need. Alexios and Urban had previously been in close contact in 1089 and after, and had discussed openly the prospect of the (re)union of the Christian church. There were signs of considerable co-operation between Rome and Constantinople in the years immediately before the crusade. In July 1095, Urban turned to his homeland of France to recruit men for the expedition. His travels there culminated in the ten day Council of Clermont, where on Tuesday 27 November he gave an impassioned sermon to a large audience of French nobles and clergy. There are five versions of the speech recorded by people who may have been at the council (Baldric of Dol, Guibert of Nogent, Robert the Monk, and Fulcher of Chartres) or who went on crusade (Fulcher and the anonymous author of the Gesta Francorum), as well as other versions found in later historians (such as William of Malmesbury and William of Tyre). All of these versions were written after Jerusalem had been captured. Thus it is difficult to know what was actually said and what was recreated in the aftermath of the successful crusade. The only contemporary records are a few letters written by Urban in 1095. The five versions of the speech differ widely from one another in regard to particulars, but all versions except that in the Gesta Francorum agree that Urban talked about the violence of European society and the necessity of maintaining the Peace of God; about helping the Greeks, who had asked for assistance; about the crimes being committed against Christians in the east; and about a new kind of war, an armed pilgrimage, and of rewards in heaven, where remission of sins was offered to any who might die in the undertaking. They do not all specifically mention Jerusalem as the ultimate goal. However, it has been argued that Urban's subsequent preaching reveals that he expected the expedition to reach Jerusalem all along. According to one version of the speech, the enthusiastic crowd responded with cries of Deus vult! ("God wills it!"). The great French nobles and their trained armies of knights, however, were not the first to undertake the journey towards Jerusalem. 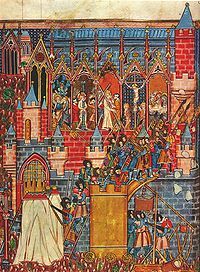 Urban had planned the departure of the first crusade for 15 August 1096, the Feast of the Assumption, but months before this, a number of unexpected armies of peasants and petty nobles set off for Jerusalem on their own, led by a charismatic priest called Peter the Hermit. Peter was the most successful of the preachers of Urban's message, and developed an almost hysterical enthusiasm among his followers, although he was probably not an "official" preacher sanctioned by Urban at Clermont. A century later he was already a legendary figure; William of Tyre believed that it was Peter who had planted the idea for the crusade in Urban's mind (which was taken as fact by historians until the 19th century). 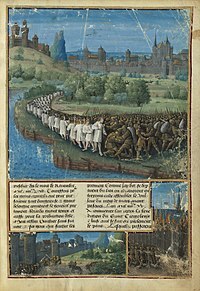 It is commonly believed that Peter's followers consisted of a massive group of untrained and illiterate peasants who did not even have any idea where Jerusalem was, but indeed there were many knights among the peasants, including Walter Sans Avoir, who was lieutenant to Peter and led a separate army. Lacking military discipline, in what likely seemed to the participants a strange land (Eastern Europe), Peter's fledgling army quickly found itself in trouble despite the fact they were still in Christian territory. The army led by Walter fought with the Hungarians over food at Belgrade, but otherwise arrived in Constantinople unharmed. Meanwhile, the army led by Peter, which marched separately from Walter's army, also fought with the Hungarians, and may have captured Belgrade. At Nish the Byzantine governor tried to supply them, but Peter had little control over his followers and Byzantine troops were needed to quell their attacks. Peter arrived at Constantinople in August, where his army joined with the one led by Walter, which had already arrived, as well as separate bands of crusaders from France, Germany, and Italy. Another army of Bohemians and Saxons did not make it past Hungary before splitting up. This unruly mob began to attack and pillage outside the city in search of supplies and food, prompting Alexios to hurriedly ferry the gathering across the Bosporus one week later. After crossing into Asia Minor, the crusaders split up and began to pillage the countryside, wandering into Seljuq territory around Nicaea. The greater experience of the Turks was overwhelming; and most of this group of the crusaders were massacred because of it. Some Italian and German crusaders were defeated and killed at Xerigordon at the end of August. Meanwhile, Walter and Peter's followers, who, although for the most part untrained in battle but led by about 50 knights, fought a battle against the Turks at Civetot in October. The Turkish archers destroyed the crusader army, and Walter was among the dead. Peter, who was absent in Constantinople at the time, later joined the main crusader army, along with the few survivors of Civetot. At a local level, the preaching of the First Crusade ignited the Rhineland massacres perpetrated against Jews, which some historians have deemed "the first Holocaust". At the end of 1095 and beginning of 1096, months before the departure of the official crusade in August, there were attacks on Jewish communities in France and Germany. In May 1096, Emicho of Flonheim (sometimes incorrectly known as Emicho of Leiningen) attacked the Jews at Speyer and Worms. Other unofficial crusaders from Swabia, led by Hartmann of Dillingen, along with French, English, Lotharingian and Flemish volunteers, led by Drogo of Nesle and William the Carpenter, as well as many locals, joined Emicho in the destruction of the Jewish community of Mainz at the end of May. In Mainz, one Jewish woman killed her children rather than see them killed; the chief rabbi, Kalonymus Ben Meshullam, committed suicide in anticipation of being killed. Emicho's company then went on to Cologne, and others continued on to Trier, Metz, and other cities. Peter the Hermit may have been involved in violence against the Jews, and an army led by a priest named Folkmar also attacked Jews further east in Bohemia. Emicho's army eventually continued into Hungary but was defeated by the army of Coloman of Hungary. His followers dispersed; some eventually joined the main armies, although Emicho himself went home. Many of the attackers seem to have wanted to force the Jews to convert, although they were also interested in acquiring money from them. Physical violence against Jews was never part of the church hierarchy's official policy for crusading, and the Christian bishops, especially the Archbishop of Cologne, did their best to protect the Jews. A decade before, the Bishop of Speyer had taken the step of providing the Jews of that city with a walled ghetto to protect them from Christian violence and given their chief Rabbis the control of judicial matters in the quarter. Nevertheless, some also took money in return for their protection. The attacks may have originated in the belief that Jews and Muslims were equally enemies of Christ, and enemies were to be fought or converted to Christianity. Godfrey of Bouillon was rumoured to have extorted money from the Jews of Cologne and Mainz, and many of the Crusaders wondered why they should travel thousands of miles to fight non-believers when there were already non-believers closer to home. The attacks on the Jews were witnessed by Ekkehard of Aura and Albert of Aix; among the Jewish communities, the main contemporary witnesses were the Mainz Anonymous, Eliezer ben Nathan, and Solomon bar Simson. The four main crusader armies left Europe around the appointed time in August 1096. They took different paths to Constantinople and gathered outside its city walls between November 1096 and April 1097; Hugh of Vermandois arrived first, followed by Godfrey, Raymond, and Bohemond. This time, Emperor Alexios was more prepared for the crusaders; there were fewer incidents of violence along the way. Urban's speech had been well-planned: he had discussed the crusade with Adhemar of Le Puy and Raymond IV, Count of Toulouse, and instantly the expedition had the support of two of southern France's most important leaders. Adhemar himself was present at the Council and was the first to "take the cross". During the rest of 1095 and into 1096, Urban spread the message throughout France, and urged his bishops and legates to preach in their own dioceses elsewhere in France, Germany, and Italy as well. However, it is clear that the response to the speech was much greater than even the Pope, let alone Alexios, expected. On his tour of France, Urban tried to forbid certain people (including women, monks, and the sick) from joining the crusade, but found this nearly impossible. In the end, most who took up the call were not knights, but peasants who were not wealthy and had little in the way of fighting skills, in an outpouring of a new emotional and personal piety that was not easily harnessed by the ecclesiastical and lay aristocracy. Typically, preaching would conclude with every volunteer taking a vow to complete a pilgrimage to the Church of the Holy Sepulchre; they were also given a cross, usually sewn onto their clothes. As Thomas Asbridge wrote, "Just as we can do nothing more than estimate the number of thousands who responded to the crusading ideal, so too, with the surviving evidence, we can gain only a limited insight into their motivation and intent." Previous generations of scholars argued that the crusaders were motivated by greed, hoping to find a better life away from the famines and warfare occurring in France, but as Asbridge notes, "This image is ... profoundly misleading." He argues that greed was unlikely to have been a major factor because of the extremely high cost of travelling so far from home, and because almost all of the crusaders eventually returned home after completing their pilgrimage rather than trying to carve out possessions for themselves in the Holy Land. It is difficult or impossible to assess the motives of the thousands of poor for whom there is no historical record, or even those of important knights, whose stories were usually retold by monks or clerics. As the secular medieval world was so deeply ingrained with the spiritual world of the church, it is quite likely that personal piety was a major factor for many crusaders. Despite this popular enthusiasm, however, Urban ensured that there would be an army of knights, drawn from the French aristocracy. Aside from Adhemar and Raymond, other leaders he recruited throughout 1096 included Bohemond of Taranto, a southern Italian ally of the reform popes; Bohemond's nephew Tancred; Godfrey of Bouillon, who had previously been an anti-reform ally of the Holy Roman Emperor; his brother Baldwin of Boulogne; Hugh I, Count of Vermandois, brother of the excommunicated Philip I of France; Robert Curthose, brother of William II of England; and his relatives Stephen II, Count of Blois and Robert II, Count of Flanders. The crusaders represented northern and southern France, Flanders, Germany, and southern Italy, and so were divided into four separate armies that were not always cooperative, though they were held together by their common ultimate goal. The motives of the nobility are somewhat clearer than those of the peasants; greed was apparently not a major factor. Runciman (1951) assumed that only younger members of a family went on crusade, looking for wealth and adventure elsewhere, as they had no prospects for advancement at home. Riley-Smith (1998) has shown that this was not always the case. The crusade was led by some of the most powerful nobles of France, who left everything behind, and it was often the case that entire families went on crusade at their own great expense. For example, Robert of Normandy loaned the Duchy of Normandy to his brother William II of England, and Godfrey sold or mortgaged his property to the church. According to Tancred's biographer, he was worried about the sinful nature of knightly warfare, and was excited to find a holy outlet for violence. Tancred and Bohemond, as well as Godfrey, Baldwin, and their older brother Eustace III, Count of Boulogne, are examples of families who crusaded together. Riley-Smith argues that the enthusiasm for the crusade was perhaps based on family relations, as most of the French crusaders were distant relatives. Nevertheless, in at least some cases, personal advancement played a role in Crusaders' motives. For instance, Bohemond was motivated by the desire to carve himself out a territory in the east, and had previously campaigned against the Byzantines to try to achieve this. The Crusade gave him a further opportunity, which he took after the Siege of Antioch, taking possession of the city and establishing the Principality of Antioch. The size of the entire crusader army is difficult to estimate; various numbers were given by the eyewitnesses, and equally various estimates have been offered by modern historians. Crusader military historian David Nicolle considers the armies to have consisted of about 30,000–35,000 crusaders, including 5,000 cavalry. Raymond had the largest contingent of about 8,500 infantry and 1,200 cavalry. The princes arrived in Constantinople with little food and expected provisions and help from Alexios. Alexios was understandably suspicious after his experiences with the People's Crusade, and also because the knights included his old Norman enemy, Bohemond, who had invaded Byzantine territory on numerous occasions with his father, Robert Guiscard, and may have even attempted to organize an attack on Constantinople while encamped outside the city. The crusaders may have expected Alexios to become their leader, but he had no interest in joining them, and was mainly concerned with transporting them into Asia Minor as quickly as possible. In return for food and supplies, Alexios requested the leaders to swear fealty to him and promise to return to the Byzantine Empire any land recovered from the Turks. Godfrey was the first to take the oath, and almost all the other leaders followed him, although they did so only after warfare had almost broken out in the city between the citizens and the crusaders, who were eager to pillage for supplies. Raymond alone avoided swearing the oath, instead pledging that he would simply cause no harm to the Empire. Before ensuring that the various armies were shuttled across the Bosporus, Alexios advised the leaders on how best to deal with the Seljuq armies that they would soon encounter. The Crusader armies crossed over into Asia Minor during the first half of 1097, where they were joined by Peter the Hermit and the remainder of his little army. In addition, Alexios also sent two of his own generals, Manuel Boutoumites and Tatikios, to assist the crusaders. The first objective of their campaign was Nicaea, previously a city under Byzantine rule, but which had become the capital of the Seljuq Sultanate of Rum under Kilij Arslan I. Arslan was away campaigning against the Danishmends in central Anatolia at the time, and had left behind his treasury and his family, underestimating the strength of these new crusaders. Subsequently, upon the Crusaders' arrival, the city was subjected to a lengthy siege, and when Arslan had word of it he rushed back to Nicaea and attacked the crusader army on 16 May. He was driven back by the unexpectedly large crusader force, with heavy losses being suffered on both sides in the ensuing battle. The siege continued, but the crusaders had little success as they found they could not blockade the lake, which the city was situated on, and from which it could be provisioned. To break the city, Alexios sent the Crusaders' ships rolled over land on logs, and at the sight of them the Turkish garrison finally surrendered on 18 June. The city was handed over to the Byzantine troops, which has often been depicted as a source of conflict between the Empire and the crusaders; Byzantine standards flew from the walls while the crusaders were forbidden from looting the city or even entering it except in small escorted bands. However, this policy was in accordance with the previous oaths made to Alexios, and the emperor ensured that the crusaders were well-paid for their efforts. As Thomas Asbridge writes, "the fall of Nicaea was a product of the successful policy of close co-operation between the crusaders and Byzantium." After handing custody of Nicaea to the Byzantines, the crusaders resumed their march to Jerusalem. Stephen of Blois, in a letter to his wife Adela of Blois wrote that he believed the journey would take five weeks; in reality, it took two years. At the end of June, the crusaders marched on through Anatolia. They were accompanied by some Byzantine troops under Tatikios, and still harboured the hope that Alexios would send a full Byzantine army after them. They also divided the army into two more-easily managed groups—one contingent led by the Normans, the other by the French. The two groups intended to meet again at Dorylaeum, but on 1 July the Normans, who had marched ahead of the French, were attacked by Kilij Arslan. Arslan had gathered a much larger army than he previously had after his defeat at Nicaea, and now surrounded the Normans with his fast-moving mounted archers. The Normans "deployed in a tight-knit defensive formation", surrounding all their equipment and the non-combatants who had followed them along the journey, and sent for help from the other group. When the French arrived, Godfrey broke through the Turkish lines and the legate Adhemar outflanked the Turks from the rear; thus the Turks, who had expected to destroy the Normans and did not anticipate the quick arrival of the French, fled rather than face the combined crusader army. The crusaders' march through Anatolia was thereafter unopposed, but the journey was unpleasant, as Arslan had burned and destroyed everything he left behind in his army's flight. It was the middle of summer, and the crusaders had very little food and water; many men and horses died. Fellow Christians sometimes gave them gifts of food and money, but more often than not, the crusaders simply looted and pillaged whenever the opportunity presented itself. Individual leaders continued to dispute the overall leadership, although none of them were powerful enough to take command on their own, as Adhemar was always recognized as the spiritual leader. After passing through the Cilician Gates, Baldwin of Boulogne set off on his own towards the Armenian lands around the Euphrates; his wife, his only claim to European lands and wealth, had died after the battle, giving Baldwin no incentive to return to Europe. Thus, he resolved to seize a fiefdom for himself in the Holy Land. Early in 1098, he was adopted as heir by Thoros of Edessa, a ruler who was disliked by his Armenian subjects for his Greek Orthodox religion. Thoros was later killed, during an uprising that Baldwin may have instigated. Then, in March 1098, Baldwin became the new ruler, thus creating the County of Edessa, the first of the crusader states. The crusader army, meanwhile, marched on to Antioch, which lay about halfway between Constantinople and Jerusalem. Described by Stephen of Blois as "a city great beyond belief, very strong and unassailable", the idea of taking the city by assault was a discouraging one to the crusaders. Hoping rather to force a capitulation, or find a traitor inside the city—a tactic that had previously seen Antioch change to the control of the Byzantines and then the Seljuq Turks—the crusader army set Antioch to siege on 20 October 1097. During the almost eight months of the siege, they were forced to defeat two large relief armies under the leadership of Duqaq and Fakhr al-Mulk Radwan. Antioch was so large that the crusaders did not have enough troops to fully surround it, and as a result it was able to stay partially supplied. On 4 March 1098, relief arrived in the form of a Crusader fleet, the "Saxon Crusade", bringing much needed supplies from the west. In May 1098, Kerbogha of Mosul approached Antioch to relieve the siege. Bohemond bribed an Armenian guard named Firouz to surrender his tower, and in June the crusaders entered the city and killed most of the inhabitants. However, only a few days later the Muslims arrived, laying siege to the former besiegers. According to Raymond D'Aguilers, it was at this point that a monk named Peter Bartholomew claimed to have discovered the Holy Lance in the city, and although some were skeptical, this was seen as a sign that they would be victorious. On 28 June 1098, the crusaders defeated Kerbogha in a pitched battle outside the city, a victory caused by Kerbogha's inability to organize the different factions in his army. While the crusaders were marching towards the Muslims, the Fatimid section of the army deserted the Turkish contingent, as they feared Kerbogha would become too powerful were he able to defeat the Crusaders. According to Christian eyewitnesses, an army of Christian saints came to the aid of the crusaders during the battle and crippled Kerbogha's army. Stephen of Blois, a Crusade leader, was in Alexandretta when he learned of the situation in Antioch. It seemed like their situation was hopeless so he left the Middle East, warning Alexios and his army on his way back to France. Because of what looked like a massive betrayal, the leaders at Antioch, most notably Bohemond, argued that Alexios had deserted the Crusade and thus invalidated all of their oaths to him. While Bohemond asserted his claim to Antioch, not everyone agreed (most notably Raymond of Toulouse), so the crusade was delayed for the rest of the year while the nobles argued amongst themselves. When discussing this period, a common historiographical viewpoint advanced by some scholars is that the Franks of northern France, the Provençals of southern France, and the Normans of southern Italy considered themselves separate "nations", creating turmoil as each tried to increase its individual status. Others argue that while this may have had something to do with the disputes, personal ambition among the Crusader leaders might just be as easily blamed. Meanwhile, a plague broke out, killing many among the army, including the legate Adhemar, who died on 1 August. There were now even fewer horses than before, and worse, the Muslim peasants in the area refused to supply the crusaders with food. Thus, in December, after the Arab town of Ma'arrat al-Numan was captured following a siege, history describes the first occurrence of cannibalism among the crusaders. Radulph of Caen wrote, "In Ma'arrat our troops boiled pagan adults in cooking pots; they impaled children on spits and devoured them grilled." At the same time, the minor knights and soldiers had become increasingly restless and threatened to continue to Jerusalem without their squabbling leaders. Finally, at the beginning of 1099, the march restarted, leaving Bohemond behind as the first Prince of Antioch. Proceeding down the Mediterranean coast, the crusaders encountered little resistance, as local rulers preferred to make peace with them and furnish them with supplies rather than fight, with a notable exception of the abandoned siege of Arqa. Iftikhar ad-Daula, the Fatimid governor of Jerusalem, was aware of the arrival of the Crusaders. He expelled all of Jerusalem's Christian inhabitants, to avoid the possibility of the city falling due to treason from the inside, and he poisoned most of the wells in the area. The crusaders reached Jerusalem, which had been recaptured from the Seljuqs by the Fatimids only the year before, on 7 June. Many Crusaders wept upon seeing the city they had journeyed so long to reach. Crusaders' arrival at Jerusalem revealed an arid countryside, lacking in water or food supplies. Here there was no prospect of relief, even as they feared an imminent attack by the local Fatimid rulers. There was no hope of trying to blockade the city as they had at Antioch; the crusaders had insufficient troops, supplies, and time. Rather, they resolved to take the city by assault. They might have been left with little choice, as by the time the Crusader army reached Jerusalem, it has been estimated that only about 12,000 men including 1,500 cavalry remained. These contingents, composed of men with differing origins and varying allegiances, were also approaching another low ebb in their camaraderie; e.g., while Godfrey and Tancred made camp to the north of the city, Raymond made his to the south. In addition, the Provençal contingent did not take part in the initial assault on 13 June. 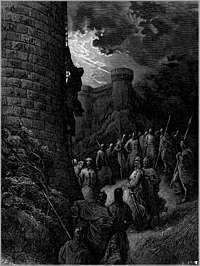 This first assault was perhaps more speculative than determined, and after scaling the outer wall the Crusaders were repulsed from the inner one. After the failure of the initial assault, a meeting between the various leaders was organized in which it was agreed upon that a more concerted attack would be required in the future. On 17 June, a party of Genoese mariners under Guglielmo Embriaco arrived at Jaffa, and provided the Crusaders with skilled engineers, and perhaps more critically, supplies of timber (stripped from the ships) to build siege engines. The Crusaders' morale was raised when a priest, Peter Desiderius, claimed to have had a divine vision, of Bishop Adhemar, instructing them to fast and then march in a barefoot procession around the city walls, after which the city would fall, following the Biblical story of Joshua at the siege of Jericho. After a three-day fast, on 8 July the crusaders performed the procession as they had been instructed by Desiderius, ending on the Mount of Olives where Peter the Hermit preached to them, and shortly afterward the various bickering factions arrived at a public rapprochement. News arrived shortly after that a Fatimid relief army had set off from Egypt, giving the Crusaders a very strong incentive to make another assault on the city. The final assault on Jerusalem began on 13 July; Raymond's troops attacked the south gate while the other contingents attacked the northern wall. Initially the Provençals at the southern gate made little headway, but the contingents at the northern wall fared better, with a slow but steady attrition of the defence. On 15 July, a final push was launched at both ends of the city, and eventually the inner rampart of the northern wall was captured. In the ensuing panic, the defenders abandoned the walls of the city at both ends, allowing the Crusaders to finally enter. The massacre that followed the capture of Jerusalem has attained particular notoriety, as a "juxtaposition of extreme violence and anguished faith". The eyewitness accounts from the crusaders themselves leave little doubt that there was great slaughter in the aftermath of the siege. Nevertheless, some historians propose that the scale of the massacre has been exaggerated in later medieval sources. After the successful assault on the northern wall, the defenders fled to the Temple Mount, pursued by Tancred and his men. Arriving before the defenders could secure the area, Tancred's men assaulted the precinct, butchering many of the defenders, with the remainder taking refuge in the Al-Aqsa Mosque. Tancred then called a halt to the slaughter, offering those in the mosque his protection. When the defenders on the southern wall heard of the fall of the northern wall, they fled to the citadel, allowing Raymond and the Provençals to enter the city. Iftikhar al-Dawla, the commander of the garrison, struck a deal with Raymond, surrendering the citadel in return for being granted safe passage to Ascalon. The slaughter continued for the rest of the day; Muslims were indiscriminately killed, and Jews who had taken refuge in their synagogue died when it was burnt down by the Crusaders. The following day, Tancred's prisoners in the mosque were slaughtered. Nevertheless, it is clear that some Muslims and Jews of the city survived the massacre, either escaping or being taken prisoner to be ransomed. The Eastern Christian population of the city had been expelled before the siege by the governor, and thus escaped the massacre. On 22 July, a council was held in the Church of the Holy Sepulchre to establish a king for the newly created Kingdom of Jerusalem. Raymond of Toulouse at first refused to become king, perhaps attempting to show his piety, but probably hoping that the other nobles would insist upon his election anyway. Godfrey, who had become the more popular of the two after Raymond's actions at the siege of Antioch, did no damage to his own piety by accepting a position as secular leader. Raymond was incensed at this development and took his army out into the countryside. The exact nature and meaning of Godfrey's title is somewhat controversial. Although it is widely claimed that he took the title Advocatus Sancti Sepulchri ("advocate" or "defender" of the Holy Sepulchre), this title is only used in a letter that was not written by Godfrey. Instead, Godfrey himself seems to have used the more ambiguous term princeps, or simply retained his title of dux from Lower Lorraine. According to William of Tyre, writing in the later 12th century when Godfrey was already a legendary hero in crusader Jerusalem, he refused to wear "a crown of gold" where Christ had worn "a crown of thorns". Robert the Monk is the only contemporary chronicler of the crusade to report that Godfrey took the title "king". The crusaders had attempted to negotiate with the Fatimids during their march to Jerusalem, but to no avail. After the crusaders captured Jerusalem from the Fatimids, they learned of a Fatimid army about to attack them. On 10 August Godfrey of Bouillon led the remaining troops from Jerusalem to Ascalon, a day's march away. The Fatimids were estimated to have as many as 50,000 troops (other sources estimate about 20,000–30,000) entering the battle. Their troops consisted of Seljuq Turks, Arabs, Persians, Kurds, and Ethiopians, led by vizier al-Afdal Shahanshah. Opposing them were the crusaders, whose numbers, estimated by Raymond of Aguilers, were around 1,200 knights and 9,000 infantry. On 12 August, crusader scouts discovered the location of the Fatimid camp, which the crusaders immediately marched towards. According to most crusader and Muslim accounts, the Fatimids were caught unaware. Because of a somewhat ill-prepared Fatimid army, the battle was fairly short, although it still took some time to resolve, according to Albert of Aix. al-Afdal Shahanshah and his army retreated into the heavily guarded and fortified city of Ascalon. The next day the crusaders learned that al-Afdal Shahanshah had retreated back to Egypt via boat, so they plundered what remained of the Fatimid camp. After returning to Jerusalem most of the crusaders returned to their homes in Europe. 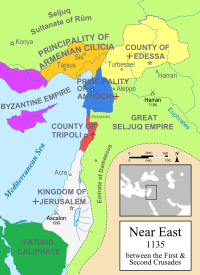 The First Crusade succeeded in establishing the "crusader states" of Edessa, Antioch, Jerusalem, and Tripoli in Palestine and Syria (as well as allies along the Crusaders' route, such as the Armenian Kingdom of Cilicia). However, there were many who had gone home before reaching Jerusalem, and many who had never left Europe at all. When the success of the crusade became known, these people were mocked and scorned by their families and threatened with excommunication by the Pope. Many crusaders who had remained with the crusade all the way to Jerusalem also went home; according to Fulcher of Chartres, there were only a few hundred knights left in the newfound kingdom in 1100. Godfrey himself only ruled for one year, dying in July 1100. He was succeeded by his brother, Baldwin of Edessa, the first person to take the title King of Jerusalem. Among the crusaders in the Crusade of 1101 were Stephen II, Count of Blois and Hugh of Vermandois, both of whom had returned home before reaching Jerusalem. This crusade was almost annihilated in Asia Minor by the Seljuqs, but the survivors helped to reinforce the kingdom upon their arrival in Jerusalem. In the following years, assistance was also provided by Italian merchants who established themselves in Syrian ports, and from the religious and military orders of the Knights Templar and the Knights Hospitaller, which were created during the reign of Baldwin I. Back at home in Western Europe, those who had survived to reach Jerusalem were treated as heroes. Robert of Flanders was nicknamed "Hierosolymitanus" thanks to his exploits. The life of Godfrey of Bouillon became legendary even within a few years of his death. In some cases, the political situation at home was greatly affected by crusader absences. For instance, while Robert Curthose was away on crusade the throne of England had passed to his brother Henry I of England instead, and their resultant conflict led to the Battle of Tinchebray in 1106. Meanwhile, the establishment of the crusader states in the east helped ease Seljuq pressure on the Byzantine Empire, which had regained some of its Anatolian territory with crusader help, and experienced a period of relative peace and prosperity in the 12th century. The effect on the Muslim dynasties of the east was gradual but important. In the wake of the death of Malik Shah I in 1092, political instability and the division of the Great Seljuq Empire prevented a coherent defence against the Latin states. Cooperation between them remained difficult for many decades, but from Egypt to Syria to Baghdad there were calls for the expulsion of the crusaders, culminating in the recapture of Jerusalem under Saladin later in the century when the Ayyubids had united the surrounding areas. The success of the crusade inspired the literary imagination of poets in France, who, in the 12th century, began to compose various chansons de geste celebrating the exploits of Godfrey of Bouillon and other crusaders. Some of these, such as the Chanson d'Antioche, are semi-historical, while others are completely fanciful, describing battles with a dragon or connecting Godfrey's ancestors to the legend of the Knight of the Swan. Together, the chansons are known as the crusade cycle. The First Crusade was also an inspiration to artists in later centuries. In 1580, Torquato Tasso wrote Jerusalem Delivered, a largely fictionalized epic poem about the capture of Jerusalem. George Frideric Handel composed music based on Tasso's poem in his opera Rinaldo. The 19th-century poet Tommaso Grossi also wrote an epic poem, which was the basis of Giuseppe Verdi's opera I Lombardi alla prima crociata. The first known mention of the Frankish conquest of Jerusalem, in an Armenian colophon written in 1099. William of Tyre began his chronicle with the fall of Jerusalem to Umar. Although the original Islamic conquest of the Levant had taken place more than four centuries before the First Crusade, its immediate cause was the occupation of Byzantine Anatolia by the Seljuqs during the 1070s to 1080s. Following the defeat at Manzikert in 1071, Muslims had taken half of the Byzantine Empire's territory, and such strategically and religiously important cities as Antioch and Nicaea had only fallen to Muslims in the decade before the Council of Piacenza. Moreover, the harrowing accounts of the atrocities committed by the invaders against the Anatolian population recorded by Eastern Christian chroniclers such as John Skylitzes, Michael Attaleiates, Matthew of Edessa, Michael the Syrian and others (summarized Vryonis 1971) align with the primary motivation of relieving the acute distress suffered by the Byzantine empire. In addition, the early 11th century saw a worsening of Muslim-Christian relations in the Levant; for example, in 1009 the Church of the Holy Sepulchre had been destroyed by the Fatimid Caliph al-Hakim bi-Amr Allah; Pope Sergius IV had supposedly already called for a military expedition in response to this. Even more recently, in the Great German Pilgrimage of 1064–1065, pilgrims had continued to be harassed. Therefore, the liberation of Jerusalem and the Holy Sepulchre is presented as the main motivation of the crusaders by contemporary historiographers more than providing military aid to the Byzantin emperor against the Seljuq onslaught. This situation of multiple possible causes or motivations for the crusades has led to extended debates in modern historiography. A theory proposed by Carl Erdmann (1935), known as the "Erdmann thesis", links the First Crusade l to the Gregorian Reform, the series of reforms initiated by Pope Gregory VII during c. 1050–80. These reforms re-established the Western Church, which had been much weakened during the 10th century, as a relevant power able to inspire and co-ordinate the crusades. The "Erdmann thesis" proposes that the strengthened Western Church, combined with the weakened Byzantine Empire, permitted a projection of power from west to east, with the actual conquest of Jerusalem figuring at best as a secondary, popular goal. While it is clear that the motivations for and causes of the First Crusade are to be sought both in the East and in the West. There has still been much debate among historiographers of the later 20th century on how the relative impact of such causes should be weighed. The very influential Steven Runciman (1951) significantly shaped the popular perception of the crusades in the later 20th century. Runciman represents the view that the motivation for the crusades was primarily that of a "barbarian invasion" motivated by greed and the desire for spoils and adventure among the Frankish nobles. Runciman argued that the crusade was motivated by a combination of theological justification for holy war and a "general restlessness and taste for adventure", especially among the Normans and the "younger sons" of the French nobility who had no other opportunities. and goes as far as suggesting that there wasn't any immediate threat from the Islamic world, arguing that "in the middle of the 11th century the lot of the Christians in Palestine had seldom been so pleasant". In a similar vein, Thomas Asbridge (2004) argues that the First Crusade was a strategic attempt to expand the power of the Western Church, and reunite the churches of Rome and Constantinople, which had been in schism since 1054. According to this view, the Islamic conquests were of little importance in this, as "Islam and Christendom had coexisted for centuries in relative equanimity". On the other hand, historians of the second half of the 20th century, such as Speros Vryonis (1971), have emphasized the importance of the military threat of Islamic expansion and the atrocities and attacks against Christians in Anatolia and the Levant. Similarly, Moshe Gil (1997) argues against Runciman on the basis of contemporary Jewish Cairo Geniza documents, as well as later Muslim accounts, concluding that the Seljuq invasion of Anatolia and the occupation of Palestine (c. 1073–1098) was a period of "slaughter and vandalism, of economic hardship, and the uprooting of populations". Indeed, drawing upon earlier writers such as Ignatius of Melitene, Michael the Syrian had recorded that the Seljuqs subjected Coele-Syria and the Palestinian coast to "cruel destruction and pillage". Thomas F. Madden (2005) represents a view almost diametrically opposed to that of Asbridge (2004); while the crusade was certainly linked to church reform and attempts to assert papal authority, he argues that it was most importantly a pious struggle to liberate fellow Christians, who, Madden claims, "had suffered mightily at the hands of the Turks". This argument distinguishes the relatively recent violence and warfare that followed the conquests of the Turks from the general advance of Islam in the early medieval period, the significance of which had been dismissed by Runciman and Asbridge. Christopher Tyerman (2006) attempted a resolution by arguing for compound causes, presenting the First Crusade as developing out of the Western church reform and theories of holy war as much as being a response to conflicts with the Islamic world throughout Europe and the Middle East. In the view of Jonathan Riley-Smith (2005), additional contingencies such as poor harvests, overpopulation, and a pre-existing movement towards colonizing the frontier areas of Europe have also contributed to the crusade; however, he also takes care to say that "most commentators then and a minority of historians now have maintained that the chief motivation was a genuine idealism". Peter Frankopan (2012) has argued that the First Crusade has been fundamentally distorted by the attention paid by historians to western (Latin) sources, rather than Greek, Syriac, Armenian, Arabic and Hebrew material from the late 11th and 12th centuries. The expedition to Jerusalem, he argues, was conceived of not by the Pope but by the Emperor Alexios I Komnenos, in response to a dramatic deterioration of Byzantium's position in Asia Minor and also as a result of a state of near anarchy at the imperial court where plans to depose Alexios or even murder him were an open secret by 1094. The appeal to Pope Urban II was a desperate move to shore up Emperor and Empire. Frankopan further argues that the primary military targets of the First Crusade in Asia Minor — Nicaea and Antioch — required large numbers of soldiers with experience in siege warfare, precisely the type of force recruited by Urban in France in his call to arms of 1095/6. ^ Riley-Smith, Jonathan (1990). The Atlas of the Crusades. p. 22. estimate a total of 40,000 crusaders, of whom some 4,500 were nobles; Runciman (1951) estimated that no more than 20% of crusaders were non-combatants and a cavalry to infantry ratio of about one to seven. Runciman, Steven (1951). A History of the Crusades, Volume One. pp. Appendix II. ; these are rough estimates, for a total number of roughly 30,000 to 40,000 combatants, including roughly 4,000 to 5,000 cavalry. ^ Nicolle 2003, pp. 21 and 32. ^ France, John (2005). The Crusades and the expansion of Catholic Christendom. New York: Routledge. p. 64. ^ Tyerman 2006, pp. 51–54. ^ H. E. J. Cowdrey (1977), "The Mahdia campaign of 1087" The English Historical Review 92, pp. 1–29. ^ Hindley, Geoffrey (2004). The Crusades: Islam and Christianity in the Struggle for World Supremacy. Carrol & Graf. ISBN 0-7867-1344-5. ^ Harris, Jonathan (2006), "Byzantium and the Crusades", London: Hambledon Continuum, p. 54. ^ a b R. A. Fletcher (1987), "Reconquest and Crusade in Spain c. 1050–1150," Transactions of the Royal Historical Society, Fifth Series, 37, p. 34. ^ a b Lynn H. Nelson (1979), "The Foundation of Jaca (1077): Urban Growth in Early Aragon," Speculum, 53 p. 697 note 27. ^ Riley-Smith 2005, p. 7. ^ Asbridge 2004, pp. 3–4. ^ Riley-Smith 1991, pp. 5–8. ^ Asbridge 2004, p. 17. ^ Holt 1989, pp. 11, 14–15. ^ Gil 1997, pp. 410, 411 note 61. ^ Holt 1989, pp. 11–14. ^ Asbridge 2004, p. 15. ^ Asbridge 2004, p. 32. ^ Riley-Smith 2005, p. 8. ^ Tyerman 2006, p. 65. ^ Asbridge 2004, pp. 78–82. ^ William of Tyre, pp. 82–85. ^ Asbridge 2004, pp. 80–81. ^ a b Riley-Smith 2005, p. 28. ^ Asbridge 2004, p. 82. ^ Riley-Smith 2005, pp. 26–27. ^ Asbridge 2004, pp. 101–103. ^ Riley-Smith 1991, p. 50. ^ Asbridge 2004, pp. 84–85. ^ Tyerman 2006, p. 102. ^ a b Tyerman 2006, p. 103. ^ Riley-Smith 2005, p. 24. ^ Tyerman 2006, pp. 103–106. ^ Asbridge 2004, pp. 103–105. ^ Asbridge 2004, pp. 46–49. ^ Asbridge 2004, pp. 65–66. ^ Asbridge 2004, p. 41. ^ Asbridge 2004, p. 68. ^ Asbridge 2004, p. 69. ^ Riley-Smith 1998, p. 15. ^ Asbridge 2004, pp. 69–71. ^ Asbridge 2004, pp. 55–65. ^ Riley-Smith 1998, p. 21. ^ Asbridge 2004, p. 77. ^ Asbridge 2004, p. 71. ^ Riley-Smith 1998, pp. 93–97. ^ a b c Neveux 2008, pp. 186–188. ^ Nicolle 2003, pp. 21, 32. ^ Asbridge 2004, p. 106. ^ Asbridge 2004, pp. 110–113. ^ Asbridge 2004, pp. 117–120. ^ Asbridge 2004, pp. 124–126. ^ Asbridge 2004, pp. 126–130. ^ Asbridge 2004, p. 130. ^ Tyerman 2006, p. 122. ^ Asbridge 2004, pp. 132–34. ^ Asbridge 2004, p. 135. ^ Asbridge 2004, pp. 135–37. ^ Asbridge 2004, pp. 138–39. ^ a b Hindley 2004, p. 37. ^ Runciman 1980, p. 149. ^ Hindley 2004, p. 38. ^ Hindley 2004, p. 39. ^ a b Asbridge 2004, pp. 163–187. ^ Tyerman 2006, p. 135. ^ Runciman 1951, p. 231. ^ Tyerman 2006, pp. 142–143. ^ Tyerman 2006, p. 137. ^ Lock 2006, p. 23. ^ Runciman 1951, p. 261. ^ Tyerman 2006, p. 150. ^ Madden, Thomas F. The New Concise History of the Crusades page 33 (Rowman & Littlefield Pub., Inc., 2005). 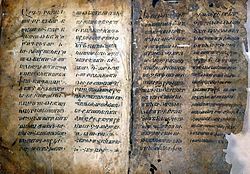 The Syriac Chronicle to 1234 is one source claiming that Christians were expelled from Jerusalem before the Crusaders' arrival. "The First and Second Crusades from an Anonymous Syriac Chronicle." Trans. A.S. Tritton. Journal of the Royal Asiatic Society, 1933, p. 73. Presumabaly this was done to prevent their collusion with the Crusaders. ^ a b c d e f Tyerman 2006, pp. 153–157. ^ Konstam 2004, p. 133. ^ Tyerman 2006, p. 159. ^ Tyerman 2006, pp. 159–160. ^ William of Tyre, Book 9, Chapter 9. ^ Riley-Smith (1979), "The Title of Godfrey of Bouillon", Bulletin of the Institute of Historical Research 52, pp. 83–86. ^ Murray, Alan V. (1990), "The Title of Godfrey of Bouillon as Ruler of Jerusalem", Collegium Medievale 3, pp. 163–178. ^ a b Baldwin 1969, p. 340. ^ a b Baldwin 1969, p. 341. ^ Tyerman 2006, p. 161. ^ Lock 2006, pp. 142–144. ^ Baldwin 1969, pp. 379–380. ^ Neveux 2008, pp. 176–177. ^ Baldwin 1969, pp. 404–405. ^ Baldwin 1969, pp. 443–447. ^ Baldwin 1969, pp. 616–620. ^ Edgington, Susan B., "Albert of Aachen and the Chansons de Geste", The Crusades and their Sources: Essays Presented to Bernard Hamilton, pp. 23–37. ^ Robert W. Thomson. The Crusaders through Armenian Eyes // The Crusades from the Perspective of Byzantium and the Muslim World / Edited by Angeliki E. Laiou and Roy Parviz Mottahedeh. — Dumbarton Oaks, 2001. — P. 72—73. ^ William of Tyre, p. 60. ^ The bull attributed to Sergius was considered genuine by Erdmann (1935), but its authenticity was later called into question. Aleksander Gieysztor ([year needed]) suggested that it was a forgery dating to after the First Crusade, while Hans Martin Schaller ([year needed]) has again argued forcefully for the document's authenticity. ^ Riley-Smith 2005, pp. 10–12. ^ William of Tyre, pp. 65–66, where he mentions the destruction of the Holy Sepulchre as a cause of the First Crusade. ^ Charles Mills (June 1820). "Mill's History of the Crusades". The Eclectic Review. Retrieved 12 August 2014. ^ Riley-Smith 1991, p. 1. ^ Riddle (2008) says that for his day Runciman was the "greatest historian of the Crusades." He reports that, "Prior to Runciman, in the early part of the [20th] century, historians related the Crusades as an idealistic attempt of Christendom to push Islam back." Runciman regarded the Crusades "as a barbarian invasion of a superior civilization, not that of the Muslims but of the Byzantines." John M Riddle (2008). A History of the Middle Ages, 300 - 1500. Rowman & Littlefield Publishing Group, Incorporated. p. 315. . Madden (2005) stresses the impact of Runciman's style and viewpoint: as having "single-handedly crafted the current popular concept of the crusades" by painting the crusaders as "simpletons or barbarians". Thomas F Madden (2005). The New Concise History Of The Crusades. Rowman & Littlefield. p. 216. ^ Runciman 1980, p. 76. ^ Runciman 1980, p. 31. ^ Asbridge 2004, p. 17; for Urban's personal motives, see pp. 19–21. ^ Vryonis 1971, pp. 85–117. ^ Gil 1997, p. 420; for details on the Seljuq occupation of Palestine, see pp. 410–420. ^ Chronique de Michel le Syrien, pp. 170–171. ^ Madden 2005, p. 7. ^ Tyerman 2006, pp. 56–57. ^ Riley-Smith 2005, p. 17. Wikimedia Commons has media related to First Crusade. Frankopan, Peter (2012). The First Crusade: The Call from the East. Harvard University Press. ISBN 978-0-674-05994-8. Hindley, Geoffrey (2004). A Brief History of the Crusades: Islam and Christianity in the Struggle for World Supremacy. London: Constable & Robinson. p. 300. ISBN 978-1-84119-766-1. Magdalino, Paul (1996). The Byzantine Background to the First Crusade. Canadian Institute of Balkan Studies. Archived from the original on 13 August 2007. Riley-Smith, Jonathan, ed. (2002). The Oxford History of the Crusades. Oxford University Press. ISBN 0-19-280312-3. Riley-Smith, Jonathan (2005). The Crusades: A History (2nd ed.). Yale University Press. ISBN 0-8264-7270-2. Runciman, Steven (1951). A History of the Crusades: Volume 1, The First Crusade and the Foundation of the Kingdom of Jerusalem. Cambridge. ISBN 978-0-521-34770-9. (abridged version: The First Crusade, Cambridge (1980), ISBN 0-521-23255-4).